Dr Muhammad joined Curtin Sarawak in 2010. He obtained his PhD degree from University of Dublin, Trinity College, Ireland. His PhD was focused on prediction of ground vibrations due to tunneling activities. 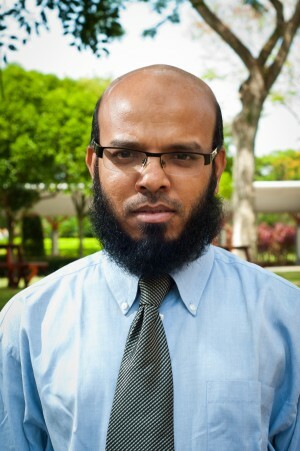 Dr Muhammad’s other research interests include sustainable construction materials, soft soil improvement, numerical modelling, soil–structure interaction and analyses techniques of masonry arches. Dr. Muhammad has served the industry in Dublin, Ireland for two and half years chiefly in the fields of design and assessment of infrastructure elements and has supervised junior engineers. He has also worked as a part time lecturer in Dublin Institute of Technology, Dublin, Ireland for one and half years. Postgraduate Research Awards (2004 & 2005); Institution of Engineers of Ireland. Muhammad Ekhlasur Rahman, (2011), “Masonry Arch Bridge: Analysis & Assessment”, LAP – LAMBERT Academic Publishing, GmbH & Co. KG, Germany, ISBN: 978-3-8443-8934-0. PS Balaji, M E Rahman, L Moussa, HH Lau, (2015), Vibration isolation of structures and equipment using wire rope isolators, “International Journal of Modern Trends in Engineering and Research, pp; 907-911. M. Leblouba, Z. Ali, B. Abdelkader, M. E. Rahman, (2014), “Nonlinear Model for Lead Rubber Bearings Including Axial Load Effects and Large Deformations”, International Journal of Civil and Structural Engineering-IJCSE, Vol. 1(3), pp 173-176. D. Sujan, X. B. Pang, M. E. Rahman, M. M. Reddy, (2014), “Performance Study of Solder Bond on Thermal Mismatch Stresses in Electronic Packaging Assembly” Materials Science Forum, Vols. 773-774, pp 242-249 [ISI Indexed]. B. H. Nagaratnam, M. E. Rahman, M. A. Mannan, (2012), “A Study on Hardened State Properties of SCC using Fly Ash and Blended Fine Aggregate”, Advanced Materials Research, Vol. 622, pp. 1789-1793. [SCOPUS Indexed]. D. Sujan., C. W. Yeo, M. E. Rahman, M. A. Maleque, & M. Y. Ali (2012) “Aluminum-Silicon Carbide Composites for Enhanced Physio-Mechanical Properties” Advanced Materials Research Vol. 576, pp. 370-374. [SCOPUS Indexed]. M.E. Rahman & S. N. Jong, (2012), “Effect of Skewness on Deck Girder Bridges”, ICCOEE2012, International Conference on Civil Offshore & Environmental Engineering, 12-14 June, 2012, Kuala lumpur, Malaysia. M.E. Rahman & Orr T., (2011), “Finite element modelling of ground vibrations due to construction of the second bore of the Dublin Port Tunnel” ASEAN Australian Engineering Congress, 25-27 July, Kuching, Sarawak, Malaysia. M.E. Rahman, Brabha H, N., Vikram P. Debnath S., & Mannan M.A., (2011), “A Preliminary Study on Self Compacting Concrete Using RHA”, 3rd CUTSE International Conference, 8-9 Nov., Sarawak, Malaysia. Montohar A., & M. E. Rahman, (2011), “Compressive strength of the oil palm shellcrete for masonry block”, The 10th National Seminar on Engineering Application, Design and industry, 3rd December 2011, University Muhammadiyah, Indonesia. Orr T & M. E. Rahman , (2008), “Prediction of ground vibration due to tunnelling”, Proceedings of the BRI08 & CRI08 Symposium, Eds. E. Cannon, R. West & P. Fanning, Galway, Ireland. M.E. Rahman. & Orr T., (2006) “A parametric study of backfill trench for reduction of TBM induced ground vibrations”, Proceedings of the Thirteenth International Congress on Sound and Vibration (ICSV13), Eds. : Eberhardsteiner, J.; Mang, H.A. ; Waubke, H. Vienna, Austria. M.E. Rahman & Orr T., (2006), “A review of strategies to control manmade induced ground vibrations”, Proceedings of the Thirteenth International Congress on Sound and Vibration (ICSV13), Eds. : Eberhardsteiner, J.; Mang, H.A. ; Waubke, H., Vienna, Austria. M.E. Rahman & Orr T., (2006), “A study of the effects of an existing tunnel on surface vibrations due to a TBM”, Proceedings of the 9th Young Geotechnical Engineers Symposium, Eds. J.A. Black and V. Sivakumar, Queens University, UK. M.E. Rahman & Fanning P., (2002), “An examination of fill effects on ratings for masonry arch bridges”, Proceedings of the 2002 Bridge Engineering Symposium, Eds. C. McNally and S. Brady, Dublin, Ireland. S. Meheron, B. Nagaratnam, M. E. Rahman & M A Ismail (2016), “The latest development in project based learning into Civil Engineering education”, International Conference on Teaching and Learning 2016, 5-6 October, Kualalumpur. D. Sujan & M. E. Rahman, (2013), “Application of Finite Element Package in Tertiary Engineering Education” 2nd International Higher Education Teaching and Learning Conference 2013, Miri, Sarawak, Malaysia. M.E. Rahman & Debnath S., (2011), “A Review of Problem Based Learning (PBL) Approach in Tertiary Engineering Education”, 1st International Conference on Teaching and Learning in Higher Education, Curtin University Sarawak. Polycal Wire Rope Vibration Isolator for Industrial Equipment, Project Leader, Fundamental Research Grant Scheme (FRGS), Ministry of Higher Education, Malaysia, July 2015-June 2017. Enhancing the Wellbore Integrity in High Pressure High Temperature CO2, Key Investigator, Fundamental Research Grant Scheme (FRGS), Ministry of Higher Education, Malaysia, July 2015-June 2018. Innovative Vibration Isolation Systems for Equipment & Structures, Project Leader, Exploratory Research Grant Scheme (ERGS), Ministry of Higher Education, Malaysia, July 2012-June 2015. Characterization of Ultrafine Palm Oil Fuel Ash under Different Heat Treatment to Suppress the Alkali Silica Reaction in Mortar Bar. Key Investigator, Fundamental Research Grant Scheme (FRGS), Ministry of Higher Education, Malaysia, July 2014-June 2017. Analytical and Numerical Approaches for Sustainable Bond Material Selection in Electronic Packaging Industry. Key Investigator, Fundamental Research Grant Scheme (FRGS), Ministry of Higher Education, January 2014-December 2015. The Development of a Sustainable Industrialized Building System Using Cold-Formed Structural Steel. Key Investigator, CSRI Flagship Grant Award 2014, Curtin Sarawak Research Institute, Malaysia, July 2015-June 2018. Behaviour of Cold-formed Steel Built-up Section, EcoSteel Sdn Bhd, September 2012-Present. Development of Novel Hybrid Polymer Bio-composite materials using Sugarcane Bagasse, Rice Husk Ash, Nano-silica and C-S-H gel in Epoxy matrix, Curtin Sarawak Collaborative Research (CSCR) Scheme, January 2014- December 2015. Computational Analysis of Small Diameter Steel Piles (SDSP) Model for Landslide Countermeasure, Curtin Sarawak Research Fund (CSRF) October 2013-September 2014. Development of normal strength self compacting concrete (SCC) using Rice Husk Ash (RHA), Curtin Sarawak Research Fund (CSRF), Completed. Attended and presented technical paper in various international conferences in many countries.